An Atlantic City man wanted on drug and gun charges was arrested in Massachusetts. Courtney Tiggett, 35, was indicted in March on 29 counts, including maintaining and operating a drug-production facility and possessing a semiautomatic handgun. 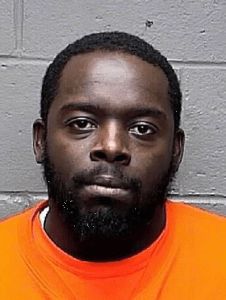 The Atlantic County Prosecutor’s Office Guns, Gangs and Narcotics Unit searched his North Connecticut Avenue home Oct. 25, 2017, with help from Atlantic City’s SWAT Team. At the time, they found about 2¼ ounces of heroin, a loaded .9mm semiautomatic handgun, two large capacity .9mm magazines, digital weighing scale, wax paper folds used to package drugs, respirator masks, an electronic mixer, sifters and various other drug paraphernalia, Atlantic County Prosecutor Damon Tyner said. He was finally arrested Oct. 4, in Fall River, Massachusetts, said Tyner, who credited the Massachusetts State Police Fugitive Unit, Fall River Police Department and New Jersey State Police Fugitive Unit.